A provincial memo lays out the Ford government's plans to cut thousands of full-time teaching positions over a four-year period, resulting in $851M in savings. A provincial memo obtained by CBC Toronto lays out the Ford government's plans to cut thousands of full-time teaching positions in Ontario beginning this fall. In the 2019-2020 school year, the memo says, there will be 1,558 fewer full-time teachers in Ontario. By the 2022-2023 school year, that number will be 3,475 — about three per cent of Ontario's current teacher workforce. Because those averages are determined by individual school boards, educators have warned that some classes — especially important prerequisites — could balloon to the high 30s. In a statement issued on Friday, Minister of Education Lisa Thompson said there are "real challenges facing our province's education system" and the government "wants to work co-operatively with union partners" to address them. But Thompson said government will not be distracted by what she calls union tactics designed to preserve their control over the education budget. "The fact is that, Ontario's teachers' unions have been handed control of the education system for the past 15 years," Thompson said in the statement. "Over the last decade and a half, Ontario has added 13,000 more teachers and more than 9,700 early childhood education (ECE) workers, resulting in an increase in teacher hiring by more than 11 per cent while enrolment declined by almost one per cent." Ontario has a much lower student-to-teacher ratio than most of the country, Thompson said, adding that year over year, teachers' salaries and benefits have increased while students continue to fall behind in important subjects like math. According to Thompson, despite what unions say, their priority has not been student success and as a result our province's math scores are dropping and our students find themselves falling further and further behind. The Toronto District School Board had predicted that larger classes would result in about 1,000 fewer teachers in its schools. 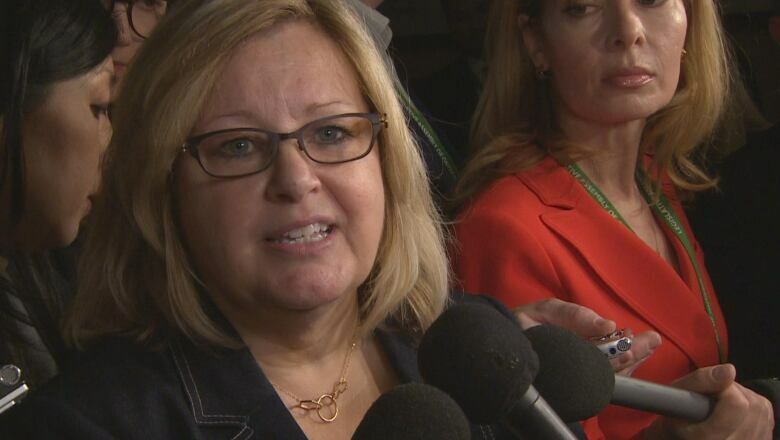 On Friday, TDSB trustee Robin Pilkey told CBC Toronto by email that the memo doesn't provide any new information, and that "the number of positions we anticipate being eliminated has not changed." The TDSB's enrolment is expected to climb by about 1,500 students in the next three years, according to a board report release in January, from its 2018-2019 level of 242,423 to 243,988 by the 2021-2022 school year. Thompson said the current plan is to ensure that no teachers will be laid off. "We will ensure we remain focused on our students and bring their marks up so all students have a better chance to get a job when they enter the workforce. It is not too late for all parties to start working together to solve the real challenges facing our students," she said. Word of the memo comes just one day after students across Ontario staged a province-wide protest over the planned changes to the education system, and a day before another planned rally set to be held at the legislature at Queen's Park.